The Description of the Blackout Window Film: Do you need a super dark room to sleep during the daytime? Your baby wakes up at the first sunray in the morning? Coavas's Opaque Blackout Window film will help you make your room even darker than with curtains. 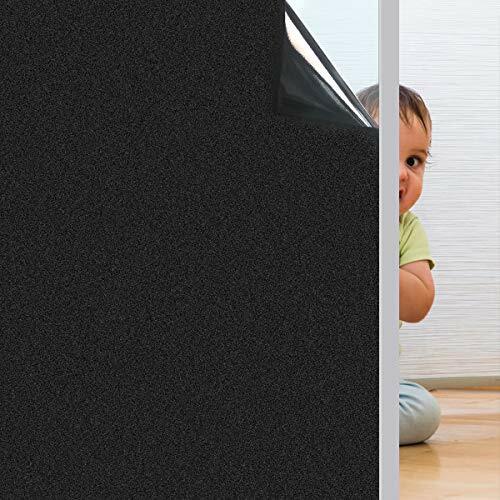 Its thick texturized material will guarantee no photon from the outside enters your room! Afraid that you can't cut it straight and you will ruin the whole window film roll? No worries! We've designed a unique guideline pattern to make sure you can measure and cut it perfectly to block every corner of your window. The guideline pattern is drew in the protective film side, so start cutting just after you unroll it! Its super static cling will just need a wet smooth and clean surface to stick on.